Today is National Badger Day, but badgers have been far from celebrated recently. In an attempt to reduce bovine TB in dairy cows, a few weeks ago the government expanded its controversial badger cull to include several new areas. However, experts say that badgers are just acting as stripy scapegoats – although they may use more technical language. Evidence shows that the cull is ineffective, expensive and inhumane – so why do we continue with it? The answer is to appease and protect the interests of dairy farmers. Reports have showed that of the small percentage of badgers that have TB, a smaller percentage still are able to transmit it to cattle. Because the culling isn’t selective, this means that thousands of badgers which pose no threat to cows have been killed. This is often through painful and drawn-out methods, such as free-shooting, which often severely wound rather than kill outright. This all occurs at great cost to the taxpayer – the Department of Environment, Food and Rural Affairs stated that last year over £1.5M was spent on killing less than 1,500 badgers, a cost of over £1000 per badger. However, no one is talking about the link between the badger cull and the dairy industry. The cull has been driven by pressure on government by dairy producers based on consumer demand for their products. Public demand for dairy means that cows are protected by farmers and the government at the expense of other British wildlife, including badgers. This comes after the news that intensive farming has an ‘overwhelmingly negative’ impact on nature, with more than half of UK species in decline. This is just one more example of how our modern farming practices have a negative effect on the world around us – from public health to the environment to the animals involved, and now to surrounding wildlife. The public have generally been against the badger cull since it was launched in 2012. Protesters have been patrolling badger cull areas, releasing badgers from traps (which is entirely legal) and starting petitions. This government petition against the badger cull has reached almost 50,000 signatures. This warranted an official response, in which the government avoided the questions raised, and declared that it planned to continue with the method of killing badgers. In its response the government painted a rosy picture of agricultural life, and stated that bovine TB is the greatest animal health threat in the UK. 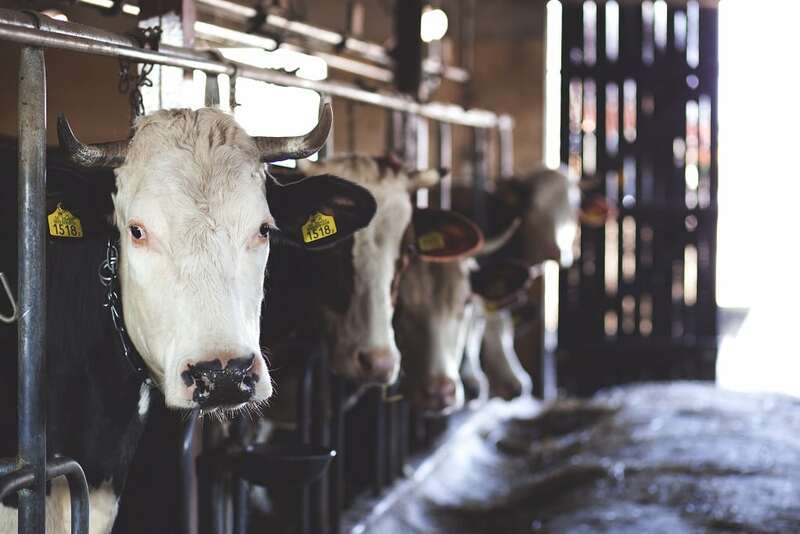 It left out the fact that the dairy cows at risk of bovine TB are destined to be killed at around a quarter of their natural life span, after a lifetime of being exploited for their milk. Male calves are routinely killed shortly after birth as they are deemed useless by the dairy industry. Surely our farming industry is a bigger threat to animal health, in that it profits from killing animals? This fact highlights our doublethink about animals. The badger cull has clearly been a political tool to keep traditionally conservative-voting farmers and farming communities onside. The government have been keen to show that they are doing something to help, that they are taking a strong stance. In reality this is manifesting in violence and cruelty rather than addressing the root cause – modern farming methods. The only logical response is to stop supporting the dairy industry, which profits from animal suffering and is devastating our wildlife. Sign up to The Vegan Society’s 30 Day Vegan Pledge for free recipes, tips and advice on going vegan. I doubt whether the badger cull has ANYTHING to do with cattle bTB or dairy. Under the Badger Protection Act, the only LAWFUL reason for killing badgers is if they pose a serious threat of disease to livestock etc or of serious harm to crops; if those threats can be mitigated by non-lethal means then it’s still illegal to kill badgers. In the recent badger cull parliamentary debate (6th Sept) lots of MPs pointed out badgers are no more of a bTB disease risk to cattle than are earthworms, flies, farm cats, deer and loads of other creatures. Badgers are unpopular with shooting estates, some arable farmers, developers and fox hunters but none of these have any lawful excuse for killing our legally protected badgers. Would strongly suggest that anyone interested in the issues should get hold of the Hansard transcript of the 6th September badger cull debate. It’s quite clear MPs now think DEFRA has been telling them “porkies” over the badger cull. yes we, the badger patrols are talking about veganism to people at our demos etc.. but we aren’t taking hipster pics of our food or prattling on about our diet, ot how flat our stomachs are in some pouty selfie. We are out there doing something to save wildlife, to help and to inform. Put the cost of milk to £5 a pint and all dairy and meat products prices should be more realistic (much higher). The demand will drop, as long as the price is high enough. People will have more respect for the animals, as unfortunately money talks. The farmers will need less livestock with more income. We will become healthier as a nation eating less meat and dairy. Except for the rich, they can pay their own medical bills. Above all stop the senseless cull now! Please pass on this message to anyone who might be able to give up a day or a night to protect our badgers against the cull. More people still needed to join the Wounded Badger Patrols, sit in patrollers’ cars (to prevent “vandals” – shooters? – damaging them), sett-sit and lots of other badger protecting, legal activities. People of all ages and fitness levels (including those with disabilities or physical frailness) can help. Newcomers will be helped and supported and everyone works within a friendly, strongly supportive community of badger protectors. Free accommodation available at the Camp Badger sites for those coming from a distance. If you think you can help please go to the Facebook pages of Stop The Cull, Team Badger, Gloucestershire Against Badger Shooting, Somerset Badger Patrol, etc for up to date information on what’s happening, what’s needed and where to meet. THANKS!! !